Cook pasta as directed on package. Drain; rinse with cold water. Meanwhile, in large bowl, mix beans, turkey, peppers, onion, chile and cilantro. In blender or food processor, combine lime juice, vinegar, garlic, cumin, dry mustard, salt and pepper. Cover; blend on medium speed 15 seconds or until smooth. With machine running, slowly add olive oil through feed cap, blending until thick and creamy. Add cooked pasta and dressing to bean mixture; toss to coat. 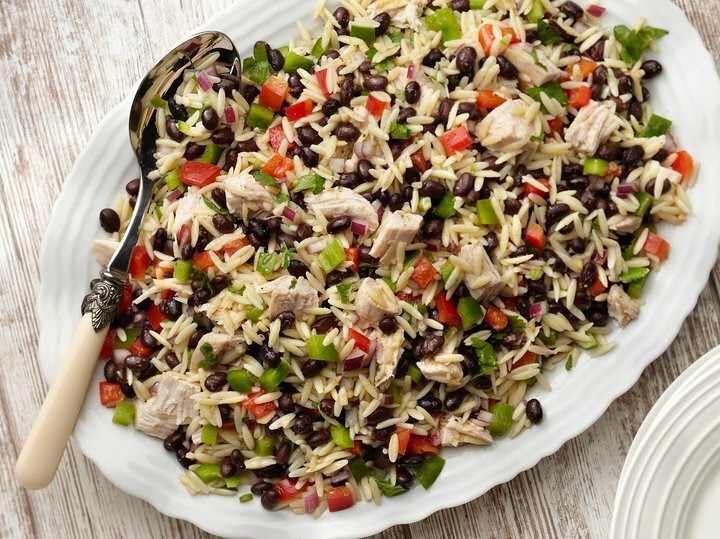 Tips: You could substitute 9 ounces of any small pasta for the orzo. Use deli turkey or leftover roast turkey in this recipe. Or, you could substitute cooked chicken for the turkey.